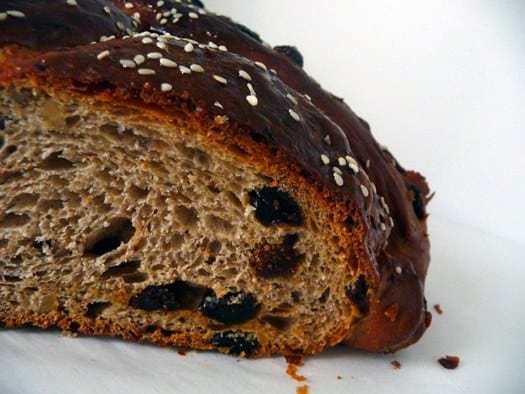 This recipe is a variation on the Greek Celebration Bread (Artos). I was immediately drawn to the Christopsomos because it appeared to be, in essence, the bread form of the Cucidati cookies I made a few months ago. The traditional Italian cookies are filled with ground figs, raisins, dates and walnuts, and flavored with orange and cinnamon. Certainly, a striking similarity to this bread and not surprising since Italy and Greece often share culinary influences and traditions. This bread was absolutely fabulous and I have already put it on my holiday baking list. It would be perfect for Christmas morning, or to have for any guests that might drop by. The combination of spices in this bread smells amazing as the dough mixes, and once you put it in the oven you’ll think that it’s Thanksgiving. Such a warm, spicy aroma that is reminiscent of the holidays. I wanted to take a moment to talk about the glaze on this bread. In the book it is listed as optional, but I really feel that it makes the bread. The mixture of a simple syrup, honey, almond, and orange really accentuates the flavors that are found inside the bread. I also love the sprinkling of sesame seeds on top of the bread – it adds a contrasting texture and a great complementary flavor. I was on the fence about doing the glaze and at the last minute decided to make it, and am so glad that I did. 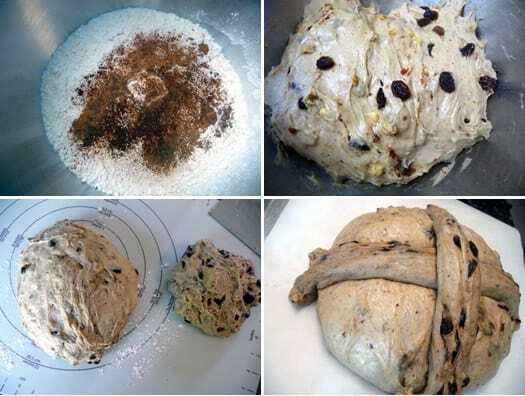 ♦ The recipe for poolish makes more than you will need for this bread, so you can make the whole recipe and save it for another bread recipe, or you can cut it in half. ♦ While kneading the bread in my Kitchen Aid mixer, I initially thought that the dough would be too wet, but resisted the urge to immediately add more flour, and let it go for 10 minutes. It turned out perfect. ♦ The first rise took about 2 hours. 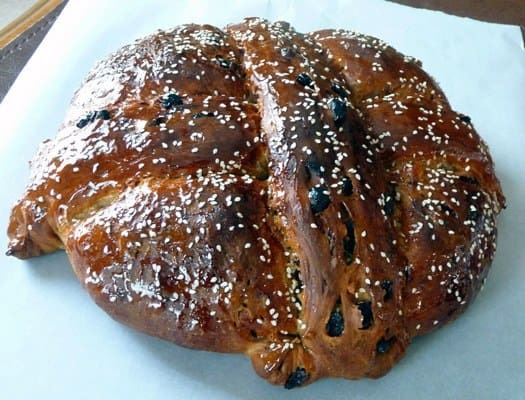 ♦ I shaped the loaf into the decorative cross, although I think I may have over-proofed the boule since I made 12″ long strands (instead of the 10″ the recipe calls for) and they still weren’t long enough to get a good coil at the ends. In addition, the boule deflated slightly with the strands on top. To make the poolish, stir together the flour, water, and yeast in a mixing bowl until all of the flour is hydrated. The dough should be soft and sticky and look like very thick pancake batter. Cover the bowl with plastic wrap and ferment at room temperature for 3 to 4 hours, or until the sponge becomes bubbly and foamy. Immediately refrigerate it. It will keep for up to 3 days in the refrigerator. To make the bread, remove the measured amount of poolish from the refrigerator 1 hour before making the dough. Stir together the flour, salt, yeast, cinnamon, nutmeg, allspice, and cloves in a large mixing bowl (or in the bowl of an electric mixer). Add the poolish, the extracts, eggs, honey, oil, and milk. Stir together with a sturdy spoon (or mix on low speed with the paddle attachment) until the dough forms a ball. Sprinkle flour on the counter, transfer the dough to the counter, and knead (or mix on medium speed with the dough hook). Add more milk or flour as needed to form the dough into a soft, but not sticky, ball. It should be tacky and very supple. Knead (or mix) for approximately 10 minutes, mixing in the raisins, figs, and walnuts during the final 2 minutes of kneading. The dough should pass the windowpane test and register 77° to 81°F. Lightly oil a bowl and transfer the dough to the bowl, rolling it around to coat it with oil. Cover the bowl with plastic wrap and ferment the dough at room temperature for 90 minutes, or until it doubles in size. Remove the dough from the bowl and shape it into a boule. Transfer it to a sheet pan that has been lined with baking parchment. Mist the dough with spray oil and loosely cover with plastic wrap. Proof at room temperature for 60 to 90 minutes, or until the dough nearly doubles in size. To make the decorative cross, before shaping the dough into a boule, divide it into pieces, 1 piece twice as big as the other. Shape the larger piece into a boule, and proof as described in Step 6. Place the smaller piece in a plastic bag and chill in the refrigerator. When the larger piece is ready is ready to bake, remove the smaller piece from the refrigerator, divide it in half, and roll each half into a 10-inch-long strand. Cross the 2 strands of dough over the top of the boule. Using a pastry scraper, split the ends of each strand and coil them to form a decorative cross. Preheat the oven to 350°F with the oven rack on the middle shelf. Bake the loaf for 20 minutes. Rotate the pan 180 degrees for even baking and continue baking for 20 to 25 minutes, or until the loaf is golden brown and registers 190°F. It should make a hollow sound when thumped on the bottom. You may glaze the loaf as soon as it comes out of the oven, if desired. To make the glaze, combine the water and sugar in a saucepan and bring to a boil. Add the honey and extract and turn off the heat. Reheat the glaze, if necessary, before applying it to the bread. 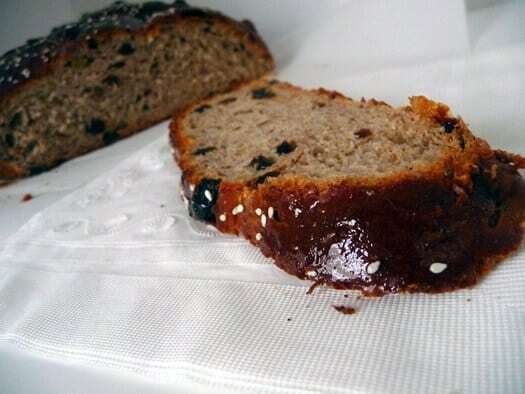 Brush the loaf with the glaze and immediately sprinkle the loaf with sesame seeds. Transfer the bread to a rack and cool for at least 1 hour before slicing or serving.